With Mt. 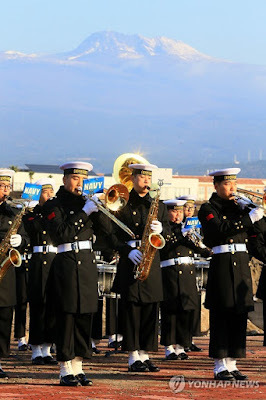 Halla in the background, a naval band performs during a ceremony at the new naval base on the southern resort island of Jeju on Dec. 22 to announce the arrival of two South Korean Aegis destroyers from the southwestern coastal base of Busan. 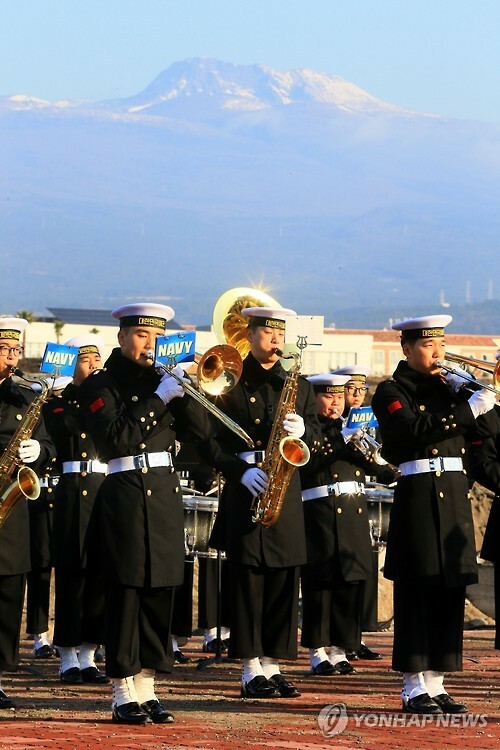 The relocation is part of the Jeju navy base's official launch scheduled for next month. 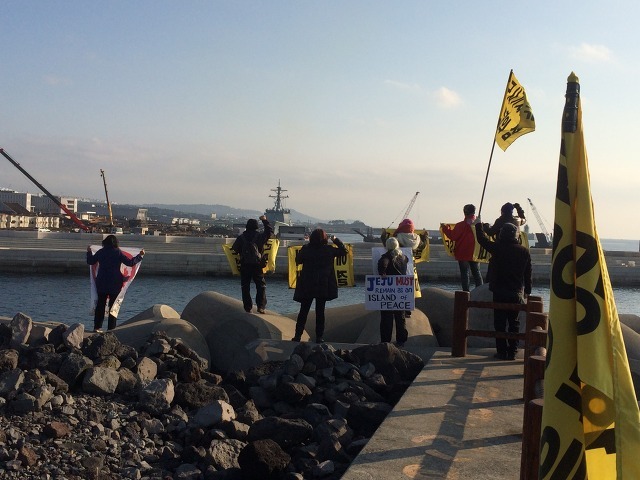 While recently in Gangjeong village on Jeju Island (with the Veterans For Peace delegation) we heard that the South Korean government was saying the new Navy base was 97% complete. Local activists, who have become experts on the status of construction during these past eight years, concluded the base was now at the 80% completion mark. Either way enough of the base has become available that warships can now be moved there. The South Korean and US governments maintain that the base was built to help contain North Korea. Yet when you look at a map of Korea you see that the Aegis destroyers (outfitted with 'missile defense' systems) are coming to Jeju from the navy base in Busan which is actually closer to North Korea. Jeju Island happens to be closer to China. The truth is that the US handed the base specifications to the right-wing South Korean regime and told them to build the base. The Status of Forces Agreement (SOFA) between Washington and Seoul allows the US full use of all South Korean bases anytime the Pentagon wishes to use them. For all intents and purposes the Jeju Navy base is a US base. The Aegis missile defense program is a key element in Pentagon first-strike attack planning. Their role is to take out any retaliatory strikes after the US hits China or Russia. The closer the US can get these systems to China or Russia the better chance they have of working in a war time scenario. These are destabilizing systems and used to be illegal under the Anti-Ballistic Missile (ABM) Treaty with Russia until George W. Bush pulled the US out of the agreement soon after taking office. Due to Obama's announced 'pivot' (the Pentagon calls it 'rebalancing') of 60% of US military forces into the Asia-Pacific to encircle China more ports-of-call are needed for Washington's surging naval forces. Thus the base on Jeju. The anti-base resistance there will evolve as the base becomes operational but all signs are saying that the determined opposition will continue in one form or the other. The Navy still wants even more of the village land so more fights are yet to come. In the meantime the best thing supporters of Gangjeong village can do is continue to oppose the cancerous US military escalation into the Asia-Pacific that not only is severely impacting the innocent people and the environment in South Korea - but is also having negative impacts in Okinawa, Japan, Guam, Philippines, Taiwan, Australia and other places where Washington is demanding more outposts for its military empire.